If you just experienced a flood, your basement or the lower levels of your house may have taken on water damage. Effects of floods may be costly to remove but not doing so can lead to health problems and further home damage. If you have just experienced a flood or think you may in the future, there are a few things you should know. 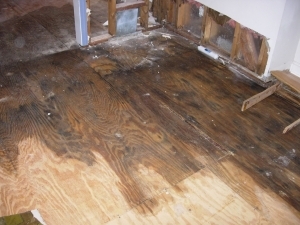 When repairing your home after flood damage, you will most likely deal with mold spores. Mold spores grow well in wet environments and can be prominent in still-water, which occurs commonly after flooding. These mold spores can appear in your home 48 hours after a flood and may be deadly. After mold has formed, it can become airborne and deposit in your lungs. This is dangerous because some types of mold can be toxic to humans. As a result, it needs to be removed before it becomes a problem. When removing mold, make sure you protect your eyes by wearing protective eyewear. Also, wear a respiratory mask so the mold cannot reach your lungs. Once you have put on the proper safety equipment, you can remove mold with soap and a sponge. You can also reduce your risk of mold by running the fans in your bathrooms and kitchen. This will reduce the ability for mold and other irritants to settle and become harmful, and it also can help dry out certain sections of your house. Floods can also carry harmful chemicals and germs into your home. While it is important for you to remove these agents as quickly as possible, it is just as necessary to do it safely. Some of these chemicals may be toxic to humans. To protect yourself from harmful chemicals and germs make sure you wear long sleeves and cover up skin that may be exposed to irritants. Also, it may be a good idea to keep a fan near you as your work to blow airborne chemicals away. After a flood, you may not know where to begin cleaning or how. When you start cleaning, make sure to use soapy-water. Soapy-water can be used to disinfect your floors, walls, and closets. It is important to disinfect these areas as soon as possible to prevent mold growth and to eliminate harmful chemicals and germs from your home. While you can use a strong disinfectant instead of soapy-water, it is important not to mix them in order to prevent a volatile reaction. Bleach can also be used to clean affected areas, but make sure you don’t mix disinfectant and bleach because it can create a volatile reaction. Make sure to also clean your clothes and rugs. These items may contain chemicals and bacteria after a flood, so it is important to disinfect them before they are worn. Generally, it is a good idea to clean clothes and rugs with soapy-water because it is easy on the fabric; however, you may need to use bleach on them instead if the pollutants don’t come out with soap. The most important thing you can do before a potential flood is find out if you live in a flood plain or an area that is prone to flooding. Most localities have elevation maps provided by the Federal Emergency Management Agency (FEMA). If you access these on your local governments website, it should alert you to parts of the county that have low elevation, which increases your risk of flooding, or which area of the county are in flood plains. Another way to help mitigate the effect of flooding is through sump pumps. Sump pumps are normally located at the lowest point of your home and help push groundwater away from the foundation. Having one can greatly reduce the effects of flooding in your home. If you know your area could been affected by a flood, it may be a good idea to purchase sand bags. Sand bags can be deployed around the foundation of your house to divert water away. The sandbags will act as a barrier for the water, and in cases of low-level flooding, water can be redirected away from your home’s foundation.